Scottsdale’s art scene is nationally and even internationally recognized for its merit, especially along the Main Street Art District. The galleries here are filled with nearly 1,000 artists, from famous artists to up-and-comers waiting for their big break. As well as finding an eclectic gathering of creative types, visitors will also find an extensive collection of art inspired by all different forms from all over the world. Join one of the Main Street art walks to get a real feel for the area. Old Town Scottsdale sits right where the original Scottsdale was founded all the way back in 1894. This neighborhood covers a few blocks and has some cute boutiques, delicious restaurants and even some interesting art galleries. Some highlights are the Old Town Candy & Toys and Fashion by Robert Black. On a sunny day (which happens a lot), this area is a great spot to walk around and enjoy the scenic history. Here at the Scottsdale Museum of Contemporary Art, visitors can enjoy an eclectic and thought-provoking collection of art. Though not very large, this museum holds some great modern artists of the South West. Each artwork strives to engage the audience on a visual level, in many different ways, from murals to sculptures to fabric art to boot. The exhibitions rotate every several months so visiting can always feel like a new experience. Lucky for party-goers, Scottsdale keeps most of its lively nightlife entertainment in just a one block radius. The entertainment district has nearly 30 restaurants, bars and nightclubs, meaning any one can find a fun time downtown here. There is always some place to go for happy hours, dancing, karaoke, or just getting a delicious cocktail. Some highlights are the Mint Ultra Lounge, a late-night club with a collection of celebrity DJs, as well as the Dierks Bentley’s Whiskey Row. 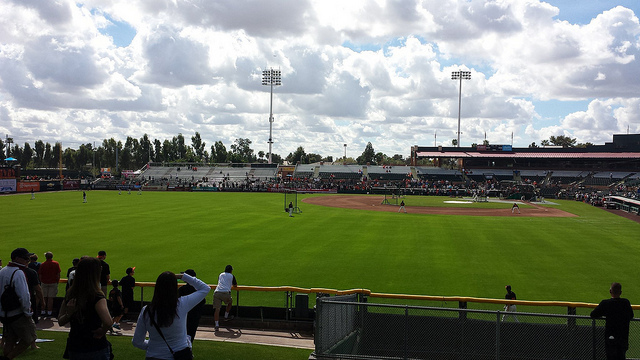 This impressive baseball stadium has been part of Scottsdale culture for over 20 years. The Scottsdale Stadium was first the home of the Phoenix Firebirds (which became the Fresno Grizzlies), before the Arizona Diamondbacks took their place. However, it’s most well-known for housing the San Francisco Giant’s spring training. Grab a beer and a hotdog and enjoy America’s favorite past-time in this scenic stadium.